It seems only fitting that Sherlock is hot on the trail of insurance malfeasance in the middle of a miserable Chicago winter. It is all quite an undertaking dealing with a grief-stricken widow living in Catatonia, Russian mobsters, Silly Putty smugglers, and a dead suspect, who shows up dead for a second time frozen solid in a 7-11 dumpster. 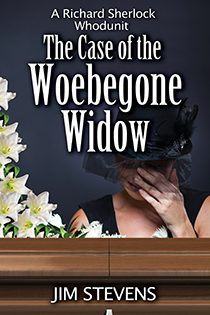 Toss in Tiffany meeting her match in a fight for affection, snow days, sniffling daughters, and an afternoon being whisked in a communal bathhouse, and you have the fifth Richard Sherlock Whodunit,The Case of the Woebegon Widow.